Atlantic Books, 2018. 280 pp. £12.99. Within my own primary area of study- Iraq and Syria- it quickly became apparent to me that one severe problem is a lack of fieldwork and solid documentation. The same can be said regarding the overabundance of punditry on the current state of affairs in Britain, despite the fact that fieldwork in Britain should be a much less expensive enterprise than its counterpart abroad. No need for hefty daily fixer fees. No need to pass through fragmented territories controlled by different militia factions. No fear of being arrested if you express the 'wrong' opinions. Columnists and contributors fill the opinion pages of Britain's leading media outlets but it can be hard to make sense of key issues of the day with all the back-and-forth of statistic citations and use of second-hand material in URLs to make arguments. Has there been a rise in meaningful employment opportunities since the 2008 recession? What is the nature of economic growth today? Of course, as technology and the world of the Internet continue to gain ascendancy and various goods and services become more accessible through mere online connectivity and clicks of buttons, there is also no denying that in recent years middle-class lives have become more convenient in multiple ways. But what is helping to drive those advances in convenience and comfort? In my view there is no substitute for first-hand experience to address and debate these matters. 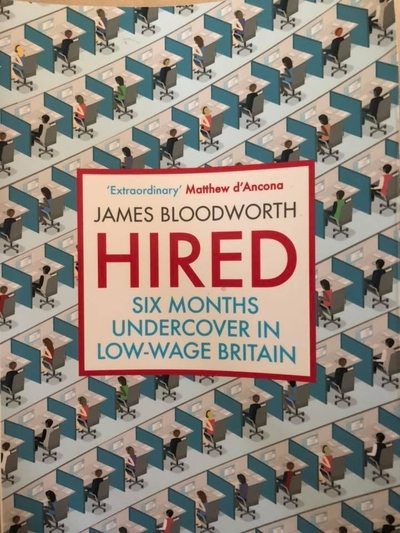 James Bloodworth, the author of Hired: Six Months Undercover in Low-Wage Britain, has provided a valuable contribution to fill the gap of primary knowledge on what it's like to work in the low-wage jobs of Britain today. Actually taking up these lines of work rather than merely interviewing sources about them, Bloodworth ventures into the world of the Amazon warehouse that helps ensure the arrival of your online orders and the life of Uber drivers, who are 'independent contractors' (i.e. not technically employees) and in theory can provide a round-the-clock service for smartphone users at cheaper rates than the conventional taxi fleets. But the author does not limit himself to these jobs that have arisen from the expansion of online technology. He also works in social care services and a call centre, the latter now notorious as the bane of university graduate underemployment. Bloodworth's experiences in these jobs take him to various parts of England and Wales: Staffordshire for the Amazon stint, Blackpool for the social care and South Wales for the call centre, before moving back to the London area for the Uber driver 'gig'. The first two jobs prove to be the most gruelling. For example, at the Amazon warehouse, where Bloodworth works as an 'order picker', the author walks an average of 10 miles per shift. The corporate giant has little patience for leaves of absence on account of sickness, as taking a day off because of illness is likely to earn you a disciplinary 'point'. Salary payments often do not arrive in full on time, posing serious issues of how to get by with food and rent costs. The social care work's key challenge is one of a race against time, whereby many of those in need of care require more than mere 20 minute appointments but worker schedules often give little leeway to go beyond the time slots. The nature of the work is such that it is not uncommon to be unable to get 8 hours of sleep per night. These problems are due in part to outsourcing of care to private companies, which compete to offer the cheapest rates for local authorities. The call centre job has more regular hours associated with conventional employment but the main problem is the sheer tedium of it, even as Admiral- the car insurance company running the call centre Bloodworth works at- tries to introduce some 'fun' at work to make the experience more enjoyable. Uber allows you to switch on the app to work whenever you wish, but once the app is switched on, you do not quite have the freedom to take on whatever jobs you like. Instead you are largely subjected to the whims of an algorithm, and which jobs you reject and the ratings you receive are closely monitored by the company. Too many rejections and you can be barred from using the app. Sometimes, at the end of a day's work, you may end up driving for a whole hour and earning no more than £5 (the minimum Uber fare, not taking into account the slice of the fare that the company takes). The introduction of UberPool (which allows customers to cut costs by sharing a ride with passengers travelling in the same direction) has put further strain on drivers' earnings, while also creating safety risks of quarrels and fights breaking out between mutual strangers (often drunk) sharing a ride. Arguably, the central observation in the book is that in the areas outside London that Bloodworth visits, new short-term and low-wage jobs have not offered an adequate replacement for the decline of the mining and manufacturing industries. To be sure, the author is careful to avoid romanticising the past. For instance, coal mines were dangerous places and posed serious health risks to the workers over the long-run even if they were not killed or injured in accidents (I would add that necessary trends to reduce carbon emissions prevent a return to coal mining). On the other hand, there was a greater sense of job security, social cohesion and guarantees for workers' rights in the form of strong trade unions. In contrast, the Amazon warehouses of today present little opportunity for organized action to campaign for better treatment of workers. After all, contracts, if they exist as documents at all, are often temporary and 'zero-hours'. Plus, there is an abundance of cheap foreign labour that recruitment agencies are ready to import. In this context, Bloodworth deserves much credit for intellectual honesty as to how his own thoughts have changed over time. He concedes that he once felt that concern over immigration was primarily due to working-class ignorance, which, as he notes, is a "very middle-class sort of prejudice." As his experiences show, it would help to acknowledge "the challenges that immigration can sometimes bring with it." As far as solutions go, Bloodworth is no policy strategist, but as with his analysis of immigration and how it was discussed and perceived on the ground during his sojourn, he offers some useful insights going forward. For one thing, concepts of 'representation' should not be fetishized: for example, the fact that a big corporation might have some non-white and female directors does not necessarily improve the lot of the minimum-wage worker in the company, regardless of that worker's ethnicity. Meanwhile, labour movements are unlikely to produce adequate responses to the present challenges by simply focusing on the workers of their own country of origin. Rather, as he notes, there needs to be "a coming together of workers of many nationalities." For my own part, I would urge the middle-class consumer not to be apathetic about the issues Bloodworth has raised. Collective consumer pressure on companies could help to change their practices for the better. I no longer buy products through Amazon, preferring to acquire books (my main purchases) from smaller booksellers. Reading Bloodworth's book has reinforced my conviction to boycott Amazon, as I gained more insight into how the corporation functions on the ground than from any number of PR statements. In the end, if worker rights are disregarded for the Uber driver and Amazon warehouse order picker, who is to say this won't affect the middle-class consumer in his/her line of work in the future? It seems particularly relevant to ponder this point with all the talk of the rise of automation that may take on increasingly complex tasks, thus eliminating the need for full-time human input in many jobs that pay above minimum wage. Complacency must be avoided.